I remember how to fish, so I've got that going for me. It's been a long time since I made a cast to an actual fish in an actual river. Too long. Way too long. But I guess after you've done a thing several thousand times in your life, you slide right back into it without too much trouble, no matter how long you've been away. I felt right at home as soon as my boots hit the water. And the fish were willing enough. That helped too. Fished for around four hours in all of the usual runs at Horseshoe Bend and had a pretty fair day. Caught a number of browns, which were feeding more or less regularly on the black caddis that were on the water. No monsters. All of the fish were in the 11-13 inch range, but fat and healthy. Caught most of them on dry flies. Nothing fancy - just a #12 Adams fished with a skate and a twitch. There was quite a bit of wind and I feel like that probably knocked the hatch down to some degree. So fish were rising, but not with any consistency. I spent a lot of time just standing and watching for a rise to cast to. 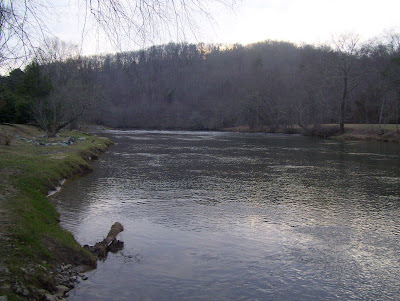 But that kind of fishing is enjoyable in its own way and gives the day a nice easy pace. It was fun. Amazingly, I only saw a couple of other anglers while I was there. 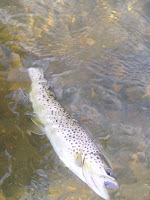 They stayed well above me, so I had this huge piece of river with rising trout all to myself. On a weekend no less. Crazy. بمجرد أن تصنع الصراصير ذاتها في البيت في البيت ، فقد يكون من العسير جدا طردها. يستطيعون تناول وجبة خفيفة على طعامك وتلف ورق الجدران والكتب والإلكترونيات. يستطيعون أيضًا أصدر مسببات الأمراض بواسطة تلويث الأكل والأجهزة المنزلية والسطوح في البيت. خدمة تلك الآفات بيان الإخلاء ومنعهم من الرجوع من خلال اختيار نهج الطعم أو المواد القاتلة للحشرات أو فخ أو حد الذي يناسبك.